The key features of the MPS® transfer system are its innovative technology and the consistent use of industrial components. 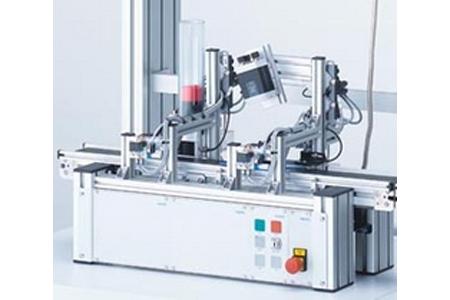 The transfer line is made of solid profiles and can be used to transport workpieces or workpiece holders. Top quality, flexible, well thought-out and modular, it is the basis for numerous successful projects. DC motor, AC motor, servo motor or stepper motor – the belt can be combined with all motor types with just a few simple actions. Professional clutches and toothed belt gearing simulate practical industrial applications while providing optimum training flexibility. The individual modules are complete automated units that can easily be integrated into a single transfer line. The MPS® transfer system focuses on topics such as sensors, electrical positioning, handling, assembly, camera inspection, barcode scanning, RFID and many more, making it an ideal platform for forward-looking projects. The transfer system is compatible with microcontrollers such as the LOGO! or more complex control systems with a wide variety of configurations. We can produce the ideal control system for you, tailored to your needs. All modules are available with both I/O wiring and a range of bus connections. A range of laboratory equipment and a trolley specially tailored to the MPS® transfer system creates the optimum working environment for you. Several kilometres of our transfer solutions are already providing a reliable material flow in the AFB, iCIM, MPS® 500 and iFactory training factories for our customers and partners worldwide. This guarantees a well thought-out concept with a high quality design to strict industrial standards. Digital training programs for specific topics relating to the MPS® transfer system facilitate effective training, including the very latest trends in automation technology. The Machine Vision training program provides the perfect introduction to modern industrial image processing. Belts play a crucial role in automated production. Products are transported using belts of different widths or even double belts. On the MPS® transfer system, material is transported on a standard industrial belt.